Not to be confused with the similarly-titled BMG collection for which I wrote the notes in 2001 (see below). 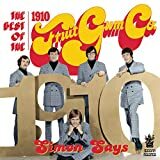 If you’re seeking the most of this splendid bubblegum band you’ll need to pick up both discs, as there are six songs on the earlier release not on this mainly singles selection, among them the essential "1910 Cotton Candy Castle." But if only one Fruitgum comp is in your future, it’d be hard to compete with this 28-track behemoth. I wish BMG had been as ambitious with their own vault artists as Germany’s Repertoire label! You’d have to dig through a lot of scuffy vinyl to assemble a comparable analog collection spanning the short, delicious career of this most infantile of semi-imaginary Buddah combos. Kicking off with the schoolyard earworm hits (including "Simon Says," "Indian Giver" and "1-2-3 Red Light"), the disc also spotlights the band (or its studio doppelgangers) in its jazzy, psychedelic and garagey manifestations. The b-sides are highlights (and a rare chance to enjoy band-penned compositions), like the growling bad girl raver "No Good Annie," and the Chinese psych-out "Reflections from the Looking Glass." Equally great are the retarded (in a good way) "Sticky Sticky" and the Link-Wray-in-orbit stylings of "Baby Bret." The comp closes with several scarce Italian-language tracks, from the Fruitgums’ late, barely-noticed Continental phase, including the exquisitely spooky "C’e Qualcosa Che Non Picardo Piu." The booklet includes notes from John Tracy and a selection of colorful 45 sleeves, sheet music covers and oddities. 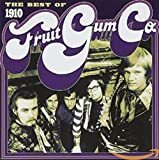 Read Kim Cooper’s notes from The Best of the 1910 Fruitgum Company.